Jonathan Adler: Using Ornaments to Create Mobiles! 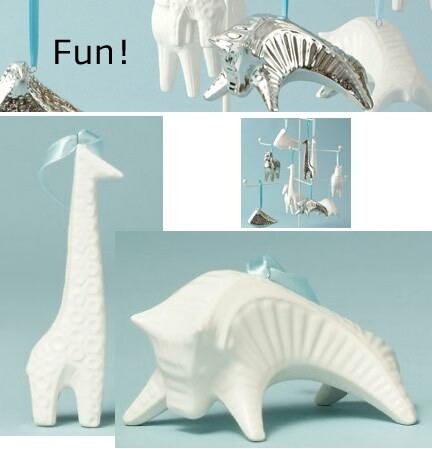 I know these Jonathan Adler holiday ornaments are for, well, the holidays, but I was thinking that since they are only around 3" high, it would be really fun to use the white animals and create a modern mobile using ribbons in bright hues. I'm not talking about a nursery mobile either; I would like to see this in my apartment, I think it would be playful but also unique, and given that I love Adler's animals, the perfect way for me to bring them into my space in an unexpected way. Do you like? Have you ever created a mobile for your space? Any photos or comments to this? West Elm - Opening in Burlington, MA September 1, 2006!